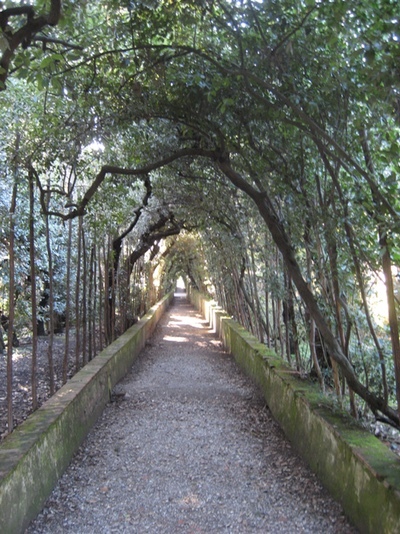 Even walking down a path is different in Italy! Wish you could come with us? Maybe you are just day dreaming at this point. I’d love to hear from you! Send me an email using the contact form on the bottom right of any page. I’d also love to hear any experiences you have with meditation, art, Italy, Italian food, wabi sabi, and all types of beauty in nature. On the bottom left of the page you can sign up to get photos of Italian gardens and quotes about gardens, Italy and meditation periodically. It is easy to un-subscribe. Many books and movies celebrate the beauty of Italy! Enchanted April – Book and movie. In the movie, two women in dreary London lives, are desperate for wisteria and sunlight in Italy. They rent a castle by the sea with two roommates for a month and their lives are transformed. Beauty, love, joy are reborn in their hearts. We will not have a castle by the sea but our 13th century tower with 21st century plumbing and heat will give us a new view on life. Our experiences in the gardens will be transforming and we will have new friends with which to share our experiences! Eat, Pray, Love – Book and movie. Book has lovely descriptions of the Italian language, Italian food and Italians in general. Makes you want to quit your job and move to Rome. Instead, spend a few days exploring Rome and then join us for a week visiting Italian gardens with kindred spirits! A Room with a View – Book and movie. In the Merchant-Ivory movie version, a young woman finds Italy challenges her sense of propriety and opens up her life. She comes alive to her senses and reconnects with the vitality of her youth. Come with us and reconnect to all your senses. We will reignite our youthful vitality! Under the Tuscan Sun – Book and then movie (a bit different plot but lovely scenery). American academic woman buys a crumbling farm-house villa in the Tuscan countryside and re-models the home as she re-models her life. We will not need to re-model a complete house to have a transformative experience in Italy. The beauty of the gardens, the simple yet effective art meditations, and all the other experiences we will share during our week are the basis for our internal re-modeling. Three Coins in the Fountain – 50’s movie about three American secretaries finding love in Rome. Lovely scenes in and around Rome. We will be staying in a villa about one hour north of Rome and I suggest you spend a few days in Rome before the retreat starts, getting over jet lag, and savoring the Eternal City. I’m happy to make suggestions of what to do and where to stay. Any other books or movies I should add to this page? Send me an email.